Journey of the Soul is divided into three parts. 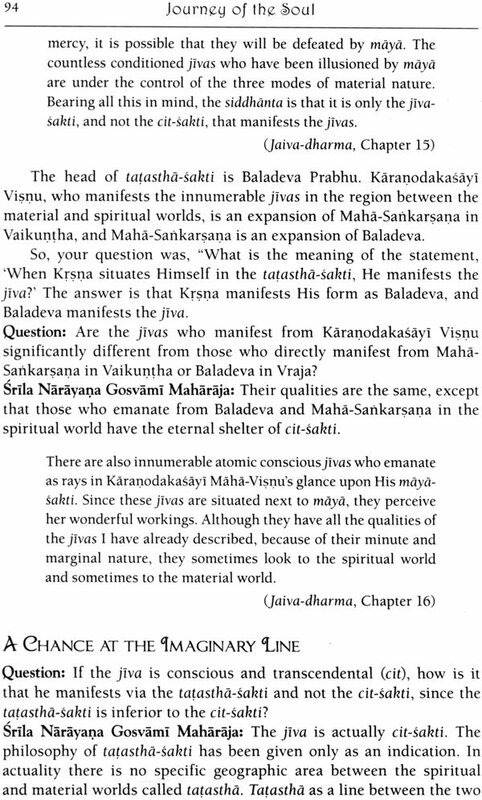 Part One, the main body of the book, consists of selected lectures, interviews, and informal meetings with Srila Narayana Gosvami Maharaja on the topic of Jiva-tattva, which were given by him over a span of about twelve years. As editors, we had two choices in regard to the presentation of the subject matter. We could keep the lectures and discussions intact, as Srila arayana Gosvami Maharaja spoke them, or we could write an adaptation in our own words. Keeping his discussions in tact, as he spoke them, would mean much repetition of ideas. This is because each lecture presented an entire idea, not as a development from a previous lecture or interview on the same subject. Also, his words were spoken to live audiences or to individuals, and therefore his language was conversational rather than literary. If we had chosen the adaptation, we would have made a fully step- by-step development of ideas throughout the book, without repetition of ideas. But then it would be a book written by conditioned souls; it would not have the full potency that this important literature needs in order to inspire and imbue the reader with true spiritual understanding. We therefore opted to keep Srila arayana Gosvami Maharaja's discussions intact, for in that way the potency of the pure devotee is present on each page. We have not presented these lectures and interviews chronologically, but in a manner that best develops the book's theme. With Srila Narayana Gosvami Maharaja's authorization and guidance we have edited his spoken words for grammatical precision, as English is not his mother tongue. We have also edited them for flow of language, because of the fact that the lectures and interviews were spoken for audiences, not written for pages. Even though you will find repetition of the same theme, we pray that this repetition will serve to clarify the profound message and help you to more easily imbibe the sacred truths herein. Part Two is an excerpt of three chapters from Srila Bhaktivinoda Thakura's book, Jaiva-dharma, which elaborates on the subject of jIva- tattva, a Sanskrit term that literally means 'the fundamental truth of the eternal spirit soul.' 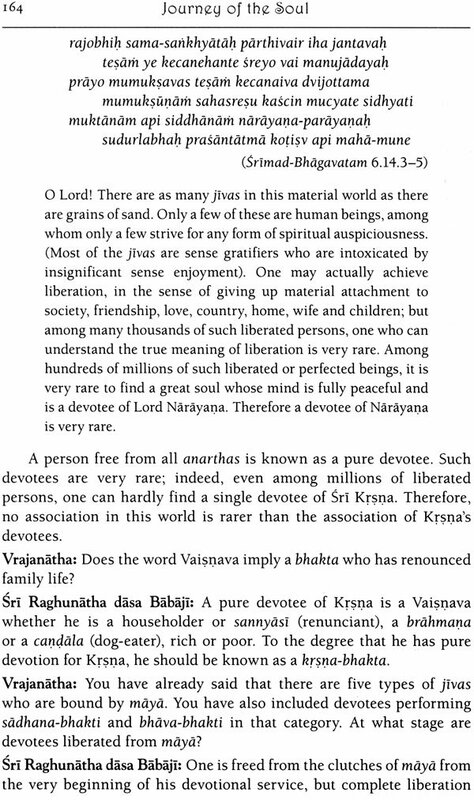 In his own discourses Srila Narayana Gosvami Maharaja glorifies Jaiva-dharma. 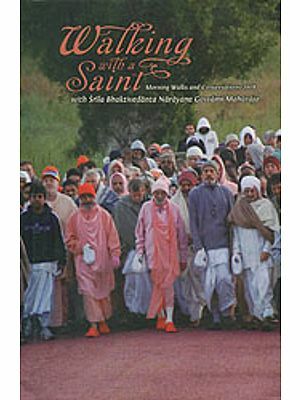 During one such discourse he said, "If you want to advance in Krsna consciousness, try to read this book again and again with very strong faith. 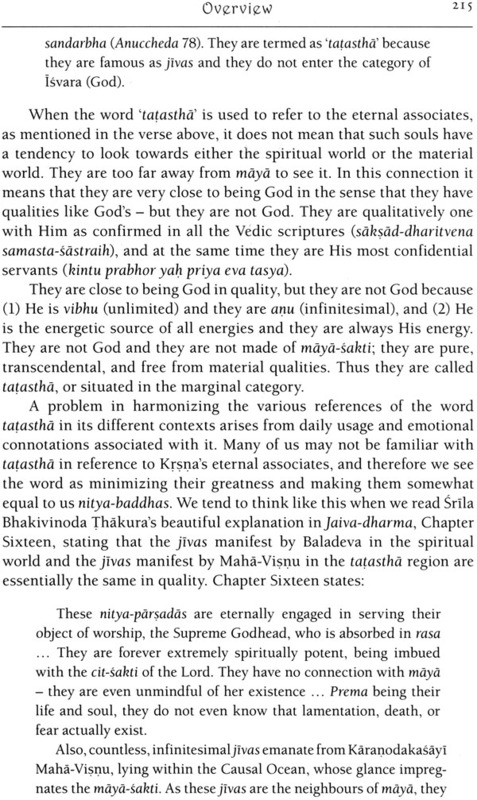 In this book you can very easily experience the essence of all Vedic literature; that is, the Vedas, the Upanisads, the SrImad-Bhagavatam, and the SrI Caitanya-caritamrta. 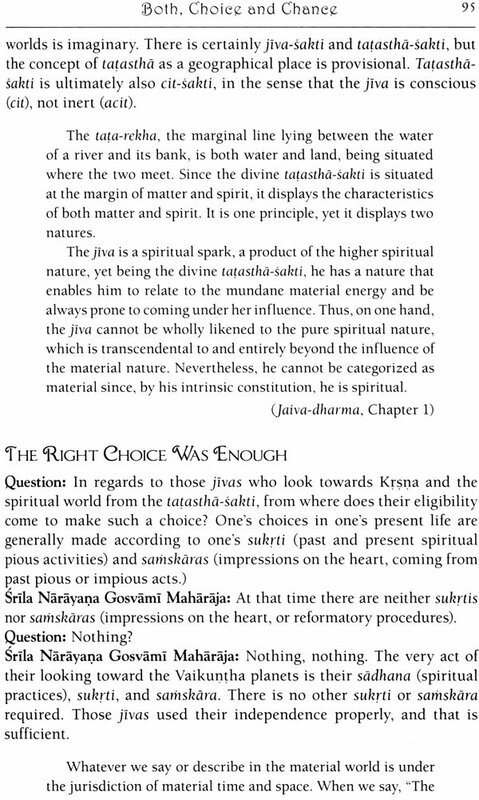 Srila Bhaktivinoda Thakura has written Jaiva-dharma in the form of a dialogue, with questions and profound answers. If you go deep in your reading, so many new spiritual understandings and realizations will come to you. I have personally read Jaiva-dharma no less than 108 times." Part Three of Journey of the Soul consists of quotes from the books, lectures, and letters of another divine representative in the Supreme Lord Sri Krsna's personal succession of realized masters, Srila Bhaktivedanta Svami Maharaja, who is renowned throughout the world as Srila Prabhupada. 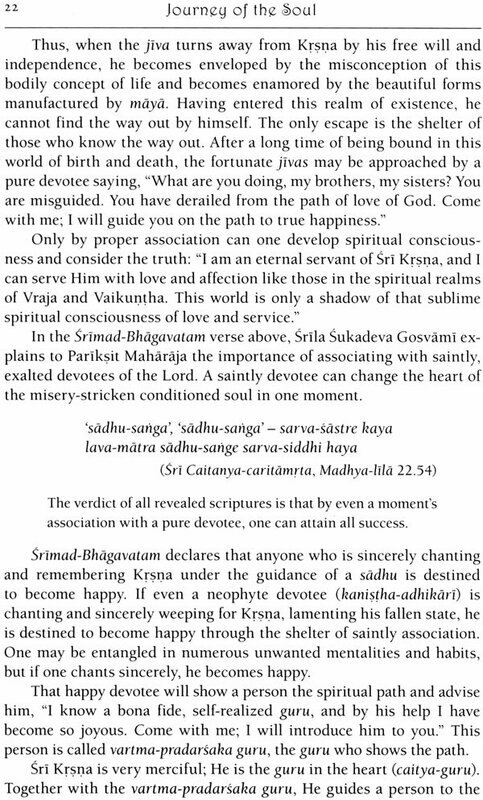 Srila Prabhupada's inspired and authoritative statements illuminate the conclusive truths on the origin, nature, and fully excellent destination of the spirit soul. Although acclaimed internationally for his establishment of a worldwide confederation of almost one hundred asramas, schools, temples, institutes, and farm communities, he always considered his treasure of devotional literature to be his most significant contribution to the world. In fact, the Bhaktivedanta Book Trust, established in 1972 to exclusively publish his works, is known as the world's largest publisher of books in the field of Indian religion and philosophy. All of the quotes that cite his books, lectures, discussions, and letters in Part Three, as well as all the quotes in Part One, are sourced from his Vedabase folio, the digital compilation of all of his original written and spoken words. 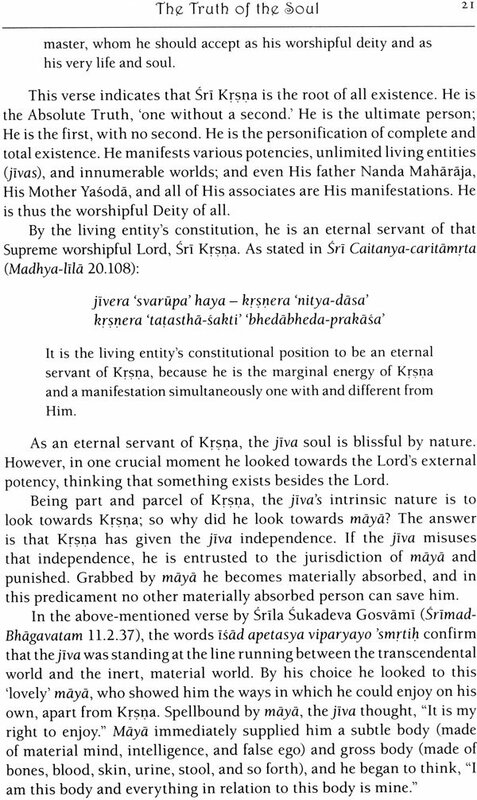 In Part One, Srila Narayana Gosvami Maharaja draws extensively from the ancient Vedic texts, and he often refers to Srila Prabhupada's translations and commentaries. We have also cited Srila Prabhupada's quotes in the form of footnotes, and unless otherwise mentioned, all the pull-quotes in the colored pull-quote boxes placed throughout the text were taken from his Vedabase-folio. 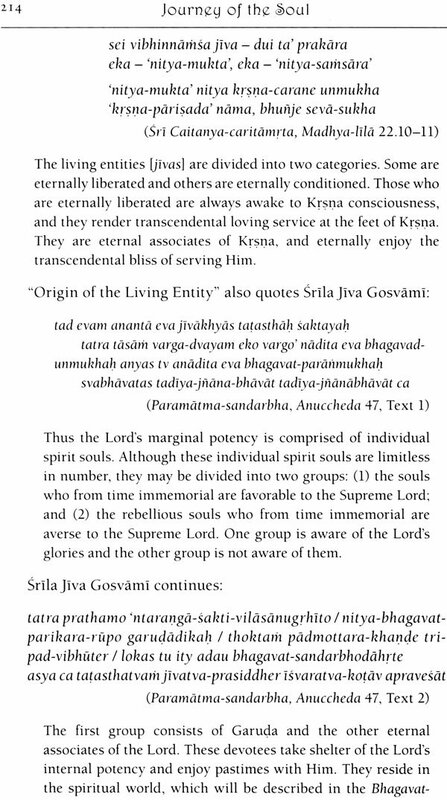 The pull-quote boxes that have statements from Bhakti-rasayana, Going Beyond Vaikuntha, Venugita and Jaiva-dharma are from the lectures and translations of Srila Narayana Gosvami Maharaja. We have attempted to keep the language of the book very straightforward and easy to understand. 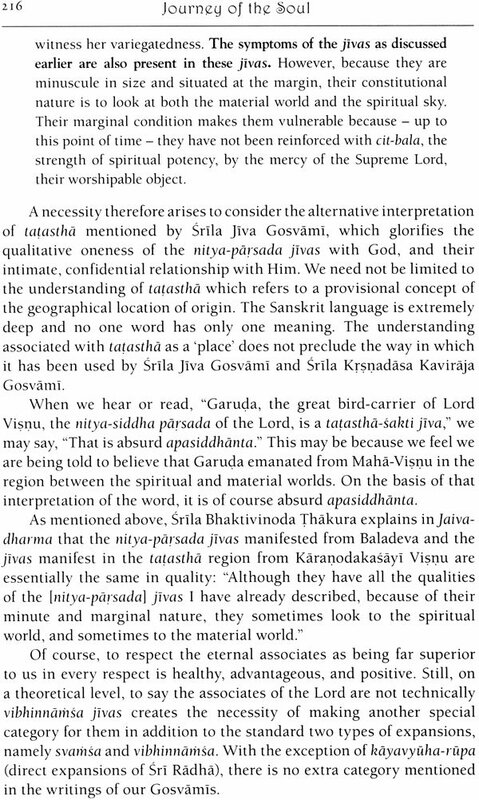 Nevertheless, Srila Narayana Gosvami Maharaja uses many Sanskrit terms in his discourses, and we have kept them the text in order to preserve the mood and precision of the meaning. For the benefit of the readers, these terms are always explained in English, either in the text itself or in the footnotes. When you find the explanation in the text or footnote insufficient, you are invited to turn to the glossary at the back of the book. Following the tradition of our spiritual preceptors, we use standard diacritical markings to indicate the pronunciation of the Sanskrit words. Pronounce a like a in father, I like ea in neat, u like 00 in root, r like ri in rip, m and it like ng in hung, sand? like sh in shy, and c like ch in chap. We pray that you, our respected readers, receive new light regarding this most profound journey of the spirit soul, whose pure being is more brilliant than millions of suns, and who has the potency to become a personal associate of God Himself. Welcome to Journey of the Soul, the window to your own journey. Please excuse any errors on our part in presenting this compilation. Srila Bhaktivedanta Narayana Gosvami Maharaja is recognized by prominent spiritual leaders and hundreds of thousands of spiritual seekers as a realized soul in this unbroken succession of pure spiritual preceptors. He is the foremost disciple of his spiritual master, Srila Bhakti Prajnana Kesava Gosvami Maharaja, and has also received profound instruction from the world-famous preacher of Krsna-consciousness and bhakti-yoga, Srila Bhaktivedanta Svami Maharaja. Srila Bhaktivedanta Narayana Gosvami Maharaja is the author's full, respected name, and his honorific title is even longer: Tridandisvami Sri Srimad Bhaktivedanta Narayana Gosvami Maharaja. 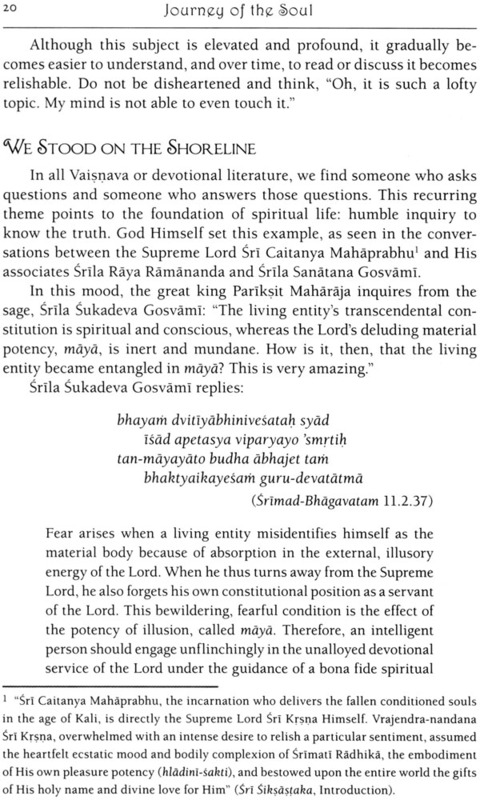 Because we have written his name so many times throughout this book, for ease and accessibility to our readers, we will generally refer to him as Srila Narayana Gosvami Maharaja. A scholar of resilient erudition in the field of Vedic wisdom, Srila Narayana Gosvami Maharaja has been inspiring seekers of spiritual and philosophical truth for over sixty years. He has published dozens of devotional literatures on the timeless science of bhakti-yoga, in both Hindi and English, which in turn have been translated into most of the major world languages. At present ninety years old, he continues to lecture around the globe, giving spiritual shelter and guidance to sincere souls. To date he has completed his thirtieth world-preaching tour. In response to the yearning questions of numerous spiritual aspirants, Srila Narayana Gosvami Maharaja requested some of his editors to compile a book of his lectures and informal talks on the subject of the eternal soul (jiva-tattva) and the individual soul's relationship with the Supreme Soul. In his compassion, he desired that all people become eligible to enter the Lord's kingdom of eternal life in unending bliss and unfathomable knowledge. He wanted to inspire in people's hearts a strong faith in that spiritual kingdom and devotional greed to enter it. Like other pure masters in his transcendental lineage, Srila Narayana Gosvami Maharaja wanted to share with his spiritual daughters and knowledge, which is descending through transcendental authority, person to person, so that each soul can receive this knowledge gently and with its most powerful effect. Journey of the Soul has come in the disciplic line of an ancient succession of spiritual teachers, a spiritual succession whose goal is to assist the soul in his journey to the supreme destination. "Where have I come from?" "How can I be free from the suffering and limitations imposed upon me by this world?" "Is there a way for me to attain knowledge of my hidden spiritual self that is beyond the chains of matter?" "What is my ultimate destination and how do I reach it?" These questions have been asked by sincere seekers of truth for millennia. According to India's ancient Vedic wisdom, the answers to these timeless questions live in the hearts of great, self-realized spiritual masters. The sages of India have realized these answers through a perfect deductive process, by the transcendental unbroken chain of disciplic succession. In this connection, consider the analogy of a mango tree. On the top of the mango tree there is a very ripe and delicious fruit. If someone were to drop a fruit from the top of the tree, it would be destroyed. Therefore it is passed from one person on the tree to another, and in this way the mango comes down intact. The ripe and delicious fruit at the top of the tree is analogous to the Vedic process of divine knowledge, which is descending through transcendental authority, person to person, so that each soul can receive this knowledge gently and with its most powerful effect. 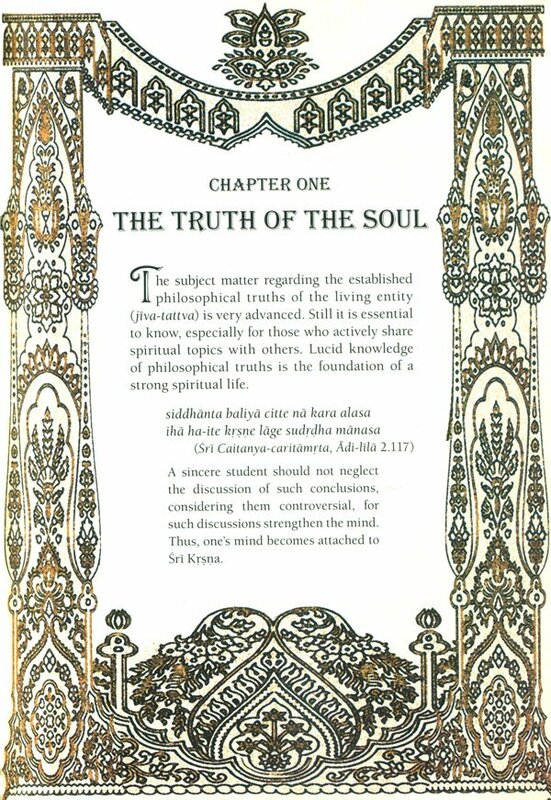 Journey of the Soul has come in the disciplic line of an ancient succession of spiritual teachers, a spiritual succession whose goal is to assist the soul in his journey to the supreme destination.